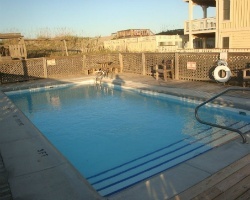 *Ocean Villas Nags Head* is a small, family resort located on a beautiful stretch of the North Carolina Outer Banks Beach! Eight ground-level units are protected and secluded by surrounding dunes that are just a short walk from an uncrowded beach. There are many attractions to see in the Outer Banks area. Guests can visit Roanoke Island (site of England's first settlement in America), the Wright Brothers National Memorial, and the 100-foot-high dunes at Jockey's Ridge State Park. A variety of restaurants will satisfy all appetites. Maintenance fee paid for 2015! Buy now and receive first year usage free! Buyer May Receive A Title Fee Credit, Inquire For Details!